Space per pupil: 42 sq.ft. A ninety year old interdepartmental collaboration had created a pedagogical approach to early education which is uniquely appropriate to Penn State. Creating a new facility provided an amazing opportunity, allowing educators and researchers to reconfirm and support the basic tenets of their mission but also to “push the envelope” in the design. Environmental education and connecting children to nature had become a high priority of the program but was severely limited by the old facility. The campus Masterplan called for a new school on a Greenfield site on the periphery of campus but the team quickly realized that removing children from the center of campus and proximity to the Department of Education was not in the best interest of broader university goals. To demonstrate Penn State's commitment to lifelong learning and the nearly 90 year history of early education on campus: relocate the early care and education program, created in 1929, to a new place – a place that connects children with nature and supports a biophilia-infused, child centered curriculum. To heal the ragged edge of the Hort Woods, the only “heritage grove” of trees on campus. Create a campus entry that reflects the University’s commitment to sustainability in a facility that also speaks to children. To explore innovative approaches to integrating sustainable design, nature, and education for young children, students, and academic researchers. 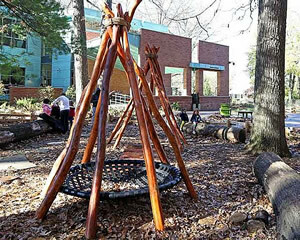 Reconnect children and nature by creating tangible links between sustainable design, curriculum, and children’s everyday experiences. Support learning about environmental stewardship through exploration. Benefiting from a 'perfect storm' of project circumstances, and using a highly collaborative and integrated design approach, Penn State University built a LEED Platinum early learning center that demonstrates the explicit connections between design, education, biophilia, and the environment. The project demonstrates how sustainable design can truly make an educational impact. The project would not have been possible without the motivation and clarity of purpose provided by the Penn State University education team but was also dependent on a highly inclusive project development process. 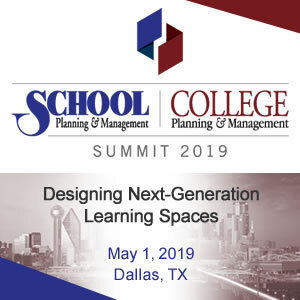 Beginning with site selection, representatives of the early learning team, education department, and campus planning were able to look beyond conventional site selection criteria to realize that keeping children on campus and "in the woods" outweighed any inherent site challenges. Since the project goals included maximizing children's connections to the out-of-doors and ensuring that key sustainability strategies are visible and engage students, user involvement at all stages of the design was critical. Involving the larger campus community in the design review process was invaluable in establishing consensus, and the University security, sustainability, and physical plant specialists were an integral part of the design process. Project challenges included an extremely constrained site containing 'old growth' trees and a need to create an architecture that could fit comfortably into the campus setting while reflecting its purpose as a place for children. The choice and composition of materials (bricks forming larger blocks, copper wrapping and folding, and exposed structure) allow children to understand the building they inhabit with the same logic as the buildings they build out of blocks or cardboard boxes. It also provides an aesthetic introduction to the architectural fabric of the campus in a playful way appropriate to the program. 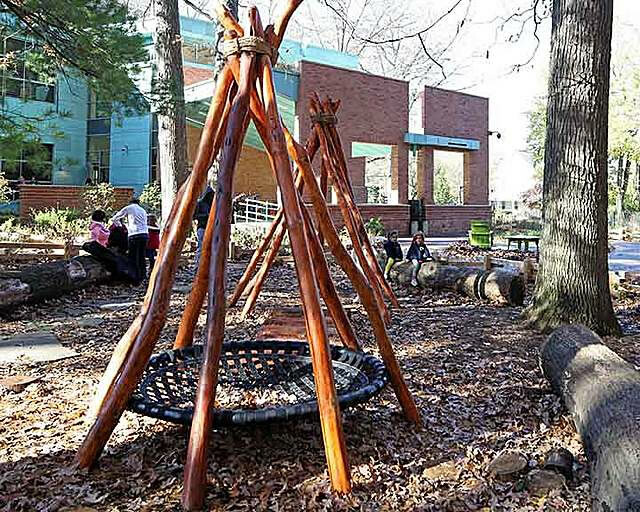 Key opportunities lay in the woods itself and the enthusiasm of the educators for their mission to connect children to the environment. The site, a somewhat forgotten parcel on the edge of the last intact wooded area on campus, was initially thought to be “too constrained” for the program but in the end, presented an amazing setting for children to engage the natural world and an opportunity for restoring and enhancing a key entry point to the campus. A "close reading" of the site (in this case, educational and emotional value of the woods, micro-climates and associated temperature gradients, and existing trees) informed the design. Working with Penn State arborists, the design team determined that in order to protect the large trees, no building elements or impervious surfaces should be introduced outside of the footprint of the existing building and parking area. This constraint, along with the desire to maintain and restore the existing natural wooded areas and micro-climatic zones, drove the plan layout. Integrating the building into the woodland edge created a wide variety of spaces. The zones, which are defined in terms of form, climate, materiality, plantings, and opportunities for different activities, all enhance the children’s experience and awareness of their environment. The building placement also marks the campus entry with careful attention to scale, materials, and a playfulness appropriate to children. The project provides a multi-level learning experience, especially in terms of the components associated with the natural environment and the sustainable systems. 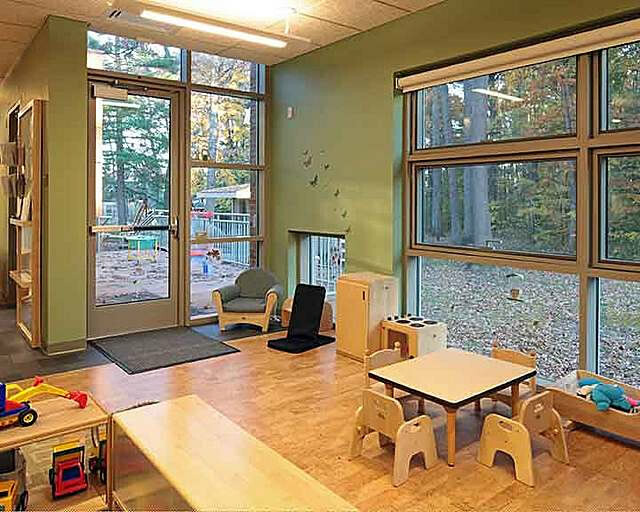 On one level, children's learning is enhanced through their exploration of a sensory rich environment created with a palette of natural materials. Children and teachers benefit from the visible and accessible sustainable components which are integrated into the curriculum. Finally, students in education and the broader university community benefit from a new educational paradigm that values biophilia and a strong relationship to the environment. Through rainwater harvesting, water is imbedded into the educational fabric of the center. The rain barrels “explain” the system and allow children to engage with it. The covered pavilion is centered on a rain barrel which collects roof rainwater and is situated at the origin of a dry stream. The stream is responsible for diverting approximately half of the building’s rooftop rainwater back into the woods (re-establishing the natural site drainage pattern) while creating a play and exploration area. Another rain barrel sits above the center’s main entrance on a rooftop vegetable garden where the children water and tend to plants that will be used in the kitchen just below their feet for future lunches. In parallel, a 6000 gallon underground cistern harvests rainwater for reuse in the building. Natural daylight is critical to a child’s well-being, acting as a beneficial “natural clock” and enhancing the overall feel of the space. It’s also a key component in the integrated green strategy for this project. 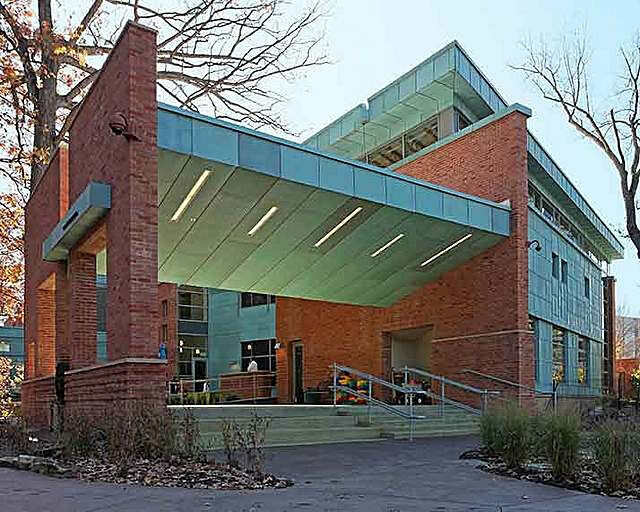 The copper-clad light shelves and clerestory windows were introduced along the south facade to allow daylight to penetrate deep into the classrooms. This horizontal light-reflecting overhang was carefully placed at the appropriate height above eye-level to bring natural light deep into the spaces and help block harsh direct summer rays. Appropriate accent colors and materials in the spaces assist to reflect light through the spaces without creating high contrast and glare situations. The material palette was chosen both for sustainability, warm natural feel, and durability, but also to create sensory rich environments and “stories” to engage children. Children explore how the cork for their floors is harvested, its properties (it’s light, it floats, it’s resilient), and use it in art projects. Outdoor bamboo hideaways relate to the bamboo stairs on the interior. Children explore how quickly it grows and how it can be used indoors as an attractive building material. Children's learning is enhanced through their exploration of a sensory-rich environment created with a palette of natural materials. 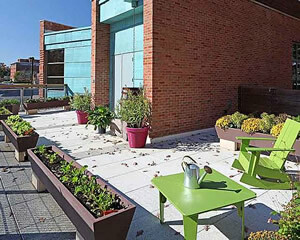 In addition to exemplary performance in several LEED materials categories, the sustainable material palette is deployed to fulfill multiple project requirements. Materials are accessible to children and become the basis for instructional/explorational narratives that inform the "green" curriculum. For example, stone pavers, salvaged from the site and re-used in the outdoor garden, work with the campus, fit in the natural setting, are readily understood and tell a story that helps children identify with stewardship of natural resources. The building section and shading devices are designed to maximize day lighting, reduce summer solar heat gain and facilitate the hybrid ventilation system. The interactive ventilation system is triggered by outdoor temperature and humidity sensors which email the center director when conditions are appropriate to engage the natural ventilation system. Large sliding windows are opened on the cool north side of the building and colored lights alert children to open sliding wall panels which in turn activate booster fans and open south-facing clerestory windows. The children further engage the system in the ‘Fanimation’ program, a collaboration with the Penn State Art Education Department where the students explore and learn about the hybrid ventilation system through art. They begin to understand the way the fans bring fresh air into the space through representation, interaction, and discussion by creating kinetic sculptures which are then animated by the fans. 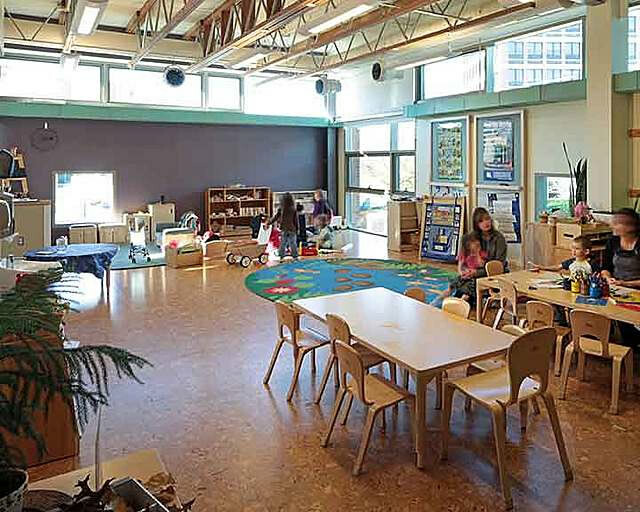 The sustainable design components support the educational process for all ages and in all settings and encourage an increased engagement with nature and technology. This particular project, with it's imperative to "heal" a critical site, its institutional enthusiasm for re-connecting children and nature, and the inherent direct relationship between the way young children learn and their immediate physical environment, is an extremely clear example of the value of a site and context specific architecture grounded in sustainability. General Contractor: Leonard S. Fiore, Inc.